'Devo-manc' is part of the government's austerity agenda and its wider attack on the NHS. We can't allow other hospitals to go the way of Trafford. Flickr/Nick Conneff. Some rights reserved.I’m a member of Tameside (Greater Manchester) Keep Our NHS Public and my local Patient Participation Group (PPG). In July I attended 6 meetings in one week connected to KONP. Over 40 years in Social Work I’ve worked in 9 hospitals, with people with disabilities and older people. Current Health and Social Care policies seriously concern me: hence all the meetings. These meetings opened my eyes. The government is devolving a £6bn budget to the ‘Greater Manchester Combined Authority’ next April. All Greater Manchester Local Authorities and all Clinical Commissioning Groups must work together within this budget. They’re somehow expected to save money, reducing the use of hospital beds, following the government’s mantra of “paying off the deficit”. I’ve seen NO open discussion locally about how ‘Integrated Care’ can work. Heavy cuts have been made to Local Authorities’ Adults Services' budgets, and are truly worrying. A 13 July Panorama programme ‘NHS: The Perfect Storm’ showed the ramifications of such cuts threatening care provision for the elderly in Liverpool. Samih Kalakeche, Liverpool Director of Adult Services and Health admitted “having sleepless nights” about this: his budget was cut by £100million. The ‘Healthy Liverpool’ programme involved Liverpool City Council and CCG in “an all-out attack on unhealthy lifestyles combined with a massive shift of care and resources – from hospitals into the community, and a joining up of the NHS with other health and social care services”. The new Liverpool Royal Hospital has fewer beds than the hospital it replaces; fewer hospitals in Liverpool altogether are predicted. Greater Manchester residents were denied a vote on such massive changes. I saw the live-streamed CCGs meeting in July select just four local hospitals to undertake certain future emergency surgery. 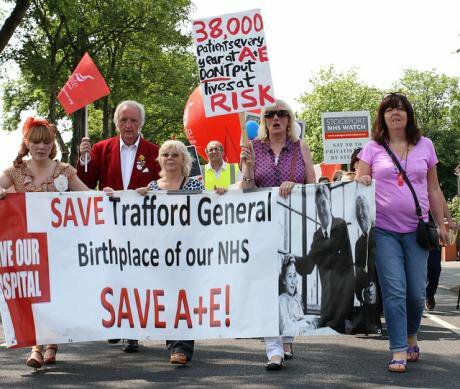 A precursor to closing or further downgrading other hospitals, as at Trafford Hospital? In late 2014 I’d attended ‘Care Together’ meetings at struggling Tameside Hospital. Three private health sector consultants, one from Kaiser Permanente (check KP’s reputation online) – foreshadowing ‘Devo Manc’ – with plans clearly preparing for eventual sell-off. Only a handful NHS, Local Authority, voluntary/independent sector staff and PPG reps were invited. From over 40 surgeries, only three PPG reps attended. After introductions, our workshop groups had to devise ways to a) cut A&E beds by at least 30%, and b) prevent people coming to A&E. One nurse, still in uniform after work, could hardly keep her eyes open. This ‘consultation’ required full-time staff, on a winter evening, without relevant training or experience, to reinvent wheels that have been running – and developing – since 1948. Of course, all Devo Manc decisions had already been taken; the views of the participants never mattered. I’d seen similar performances at 2014 meetings called ‘Healthier Together’. The NHS is being dismantled – in front of our eyes. I've seen many devoted NHS staff – some exhausted and demoralised – at such expensive, time-wasting meetings. Exorbitant consultancy fees, room hire, refreshments, staff typing notes and sending invitations… Cutting services and preparing for privatisation doesn’t come cheap! At the Hyde Healthwatch and Dukinfield Care Together meetings in July I saw GPs, seemingly programmed with questions for voluntary and independent sector reps – with no medical training. Example: "What do you think should happen when you arrive at A&E?" I’ve seen NHS Mental Health staff, service users, carers and voluntary workers spending their evenings at such meetings. I saw Stockport campaigners against Mental Health cuts planning opposition to closure of local support centres: services that save lives. "The NHS has never been more vulnerable… It’s not right even in difficult financial times, seeking to turn the NHS into a profit-driven enterprise. It was founded when the country was on its knees financially. I believe recent and proposed changes are purely ideological." So I urge fellow activists wanting the restoration of a truly public NHS to leave your laptops and mobile phones, get outside – be heard and seen! I beg you all, let’s focus on action! Underfunded community care cannot solve the gaps left by NHS cuts. Older people need good access to experienced medical staff. I have now seen and learned enough to know: any further delay risks serious harm to our health – and our NHS!